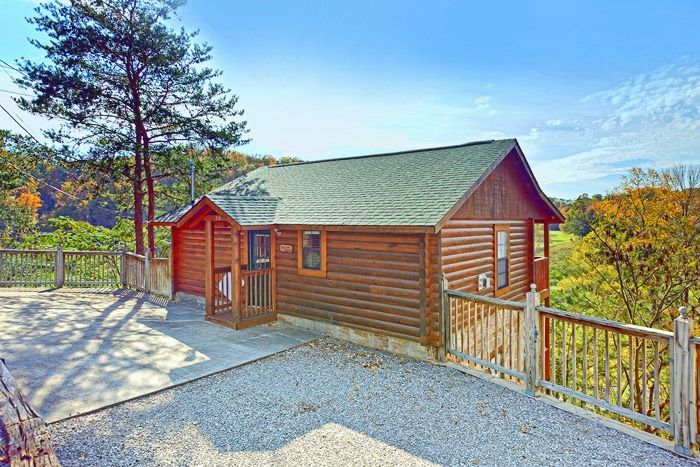 Welcome to "A Hilltop Heaven", a Pigeon Forge cabin rental with scenic mountain views, WiFi Internet, hot tub, game room and more! 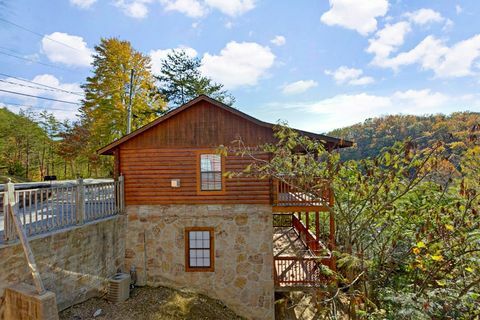 This 2-bedroom cabin rental provides accommodations for a relaxing weekend getaway in the unbeatably beautiful Smoky Mountains of Tennessee. 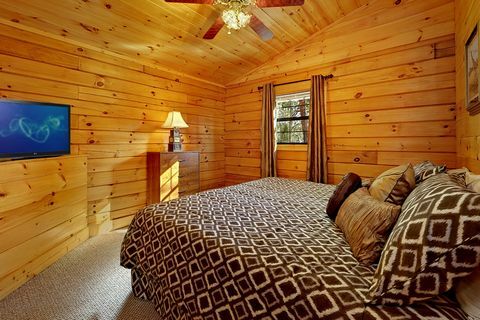 Whether you're enjoying your cabin's scenic tree-top views or the clean mountain air, you'll be glad you booked a cabin rental in Pigeon Forge, TN! 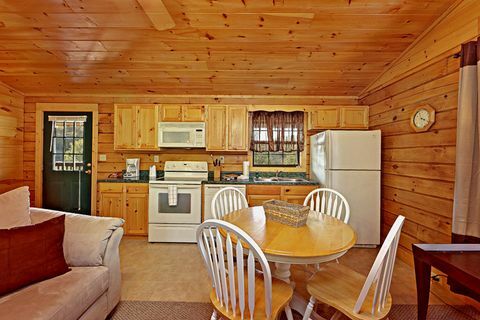 This cabin's cozy open floor plan on the main level allows guests to enjoy quality time together. Prepare a great meal to enjoy around the dining table while your family relaxes by the fireplace and television set. Also on the main level of your cabin, you'll find the master bedroom suite complete with a king-size bed and a private television. Walking downstairs to the lower level, guests find a game room with an Xbox, television, and a futon for extra sleeping space. The second bedroom is furnished with a queen-sized bed and television perfect for a movie in bed. 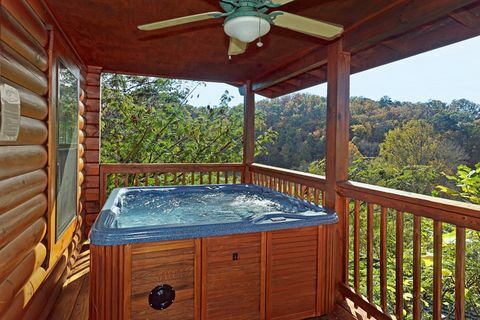 In addition to its homey interior, this Pigeon Forge cabin rentals covered deck gives guests a space to enjoy the surrounding natural beauty regardless of the weather with its hot tub, charcoal grill, and porch swing. 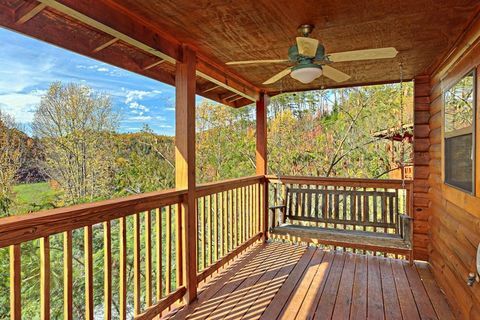 The lower level of "A Hilltop Heaven" boasts access to another covered deck as well! Enjoy beautiful mountain views and feel the breeze during your vacation in the Great Smoky Mountains of Tennessee! 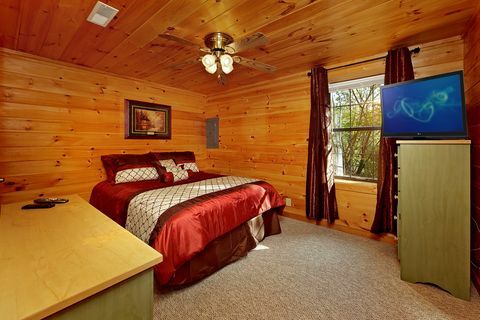 Your comfortable mountain getaway places your family mere minutes from fun-filled Pigeon Forge, Gatlinburg, and the entrance to the Great Smoky Mountains National Park. The famous Smoky Mountain Theme Park Dollywood is also convenient for guests to enjoy during their vacation. 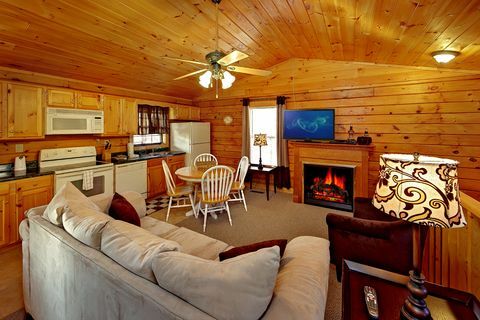 Additionally, if guests need more than one Pigeon Forge cabin rental for a family reunion or church retreat, "A Hilltop Heaven" neighbors "A Mountain Retreat" and is a stone's throw from four of our other Pigeon Forge cabins. 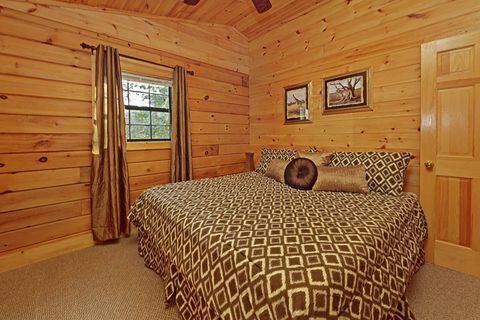 Two or more cabins can often be booked together to accommodate more guests. If a multi-cabin vacation is something that interests you, please contact our reservations office and we'll be glad to help you plan your stay! Book "Hilltop Heaven", your perfect 2-bedroom cabin rental with views, ONLINE for an immediate Cabin Discount!